In the heart of Calvi, charming house with garden, sea 100 meters. In the heart of Calvi 150 meters from a small beach, our house of 150 m² comfortably accommodates 8 people with its 4 bedrooms, 4 bathrooms and garden / terrace of 60 m². It is very bright, open on 3 facades. Its location in a quiet street allows everything to be done on foot. The harbor, restaurants and shops are 200 m away. A small beach at 150 m and small coves within 10 mn on foot. On the large calvi beach at 800 m. You can practice all nautical activities: sailboat rental, jet skiing, windsurfing. The kitchen is large and well equipped: washing machine / dishwasher, 5-burner cooker type piano, very large oven, coffee machine Nespresso and electric, kettle, toaster, self-cooker, mixer. On request: cot, stroller, high chair. BABY EQUIPMENT / CHILDREN AVAILABLE: 2 cots, 3 extra mattresses for children up to 3 years, a pram, 2 high chairs, a small table and 2 small chairs. In the shaded garden you can have lunch in the shade of the mulberry trees (tables, chairs, deckchairs, barbecue). Bed linen, towels and beach towels are provided. Beds will be made upon arrival. At your departure we take care of the housekeeping. Bathrooms in light gray waxed concrete. The floor is pebble, neat decoration. We stayed here for two weeks during the GC32 Racing competition. It was the perfect location for us as we had the marina in walking distance. We had a minor problem with the plumbing however this was fixed as soon as possible. Gisele provided and extra clean to make up for this inconvenience. Coco the house keeper lives up the street which makes this handy. It is a great house for families or if you are sharing with others. There is a double bed downstairs, ( with its own shower) one double bed upstairs ( with its own shower) and two further bedrooms upstairs with two singles in each bedroom. We had a 10 month old baby with us and the house was safe for her. There are plenty of beach toys for the kids. The only thing I was not happy with was the towels. They do need updating. We will definitely rent this property again. And we will welcome you next time with great pleasure.We always take into account the remarks of our vacationers, these allow us to improve, the towels a little tired (it is true) were changed this week. Very nice place. The garden was particularly nice. Loved it. Our second time staying here. A bientôt pour un troisième séjour ! I just spent the week in Calvi at this house with some friends and we had a great time. Calvi is a great location to stay and this house is right in the heart of Calvi - you can walk to restaurants, shops, the port, the Citadel, and multiple beaches including the main beach in Calvi. We had a car and although there is only on street parking we were always able to find a spot close by. The house itself is very spacious and comfortable and well stocked with towels (bath and beach) and plenty of dishes and cookware in the kitchen. very convienent that each room has a shower when we returned from the beach. The outside garden was amazing and was a little Oasis within the city. We ate breakfast out there every day and often had dinner as well. you are right in the heart of Calvi so if you keep the windows open at night, expect some noise but it wasn't too bad. I would highly recommend staying in this home and a vacation in Corsica as it is beautiful! Perfect! ideal for all 9 of us. The garden is a particular bonus. We spent a wonderful week. Loved the house, spacious and well equipped. Great play area in the shady garden and the bonus of outdoor meals in the heat of the day. Location is ideal too. Short walk for children to the beach, plenty of cafes close by for eating and of course, Calvi is full of interesting nooks and crannies to explore. We are already thinking of the next visit! Nous vous accueillerons à nouveau avec un grand plaisir! Beautiful house in Calvi for a family vacation. 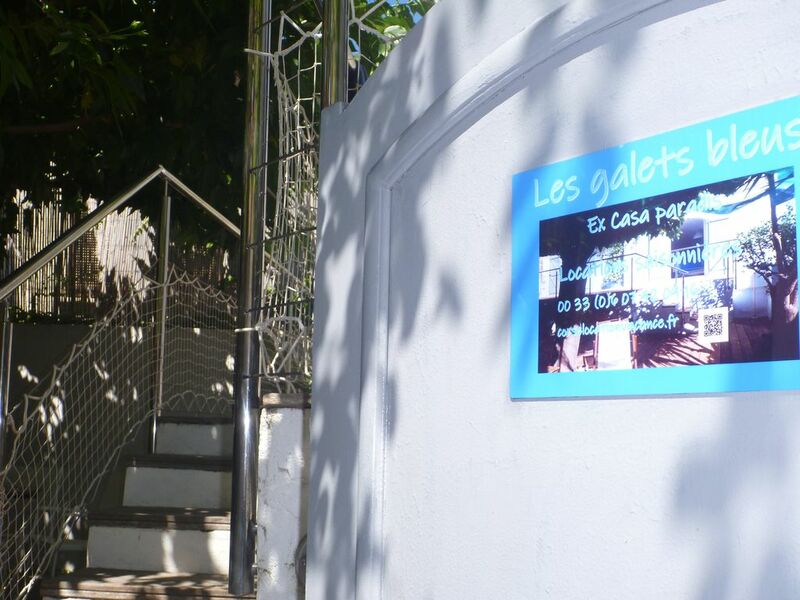 Casa Paradis in Calvi is a wonderful place for families with young children to spend their vacation. We were two families with four adults and five children ages 4-11 who spent two weeks. The house is spacious, light, beautiful, well equipped, and have all facilities for a family group. We all especially loved the patio garden, and had all our breakfasts and quite a few dinners around the large table there. The owner provided good service, all the way from the our first inquiry and until we left the house. Casa Paradis is well situated within a very short walking distance from the city center with all the restaurants and the harbor, and from the impressive citadel. Further beyond the center, also within short walking distance, lie the beatuiful, long beach. The beach is nice and clean, and well suited for families with small children. We also suggest renting a car for a few days to see the mountains and the villages, and to swim in river pools. We really recommend Casa Paradis in Calvi for a sunny and comfortable family vacation. Très sympathique accueil. Gisèle est très disponible pour toute information ou conseil. La maison est très agréable. Nous étions 7 cyclistes pour une semaine de Toussaint. Tout confort. Eau chaude à volonté. Jardin sympa. Au cœur de la ville. holiday home rental for 8 people, 4 bedrooms. Pour les réservations de moins d'une semaine (7 nuits), nous demandons un supplément de 60 € pour le ménage.